If you read my post about the tannin-iron-madder experiment, you may have noticed that I divided the original dyebath in half. I didn’t explain why at the time. My rationale was this: I worried that the iron would affect the subsequent colors I got from the exhausted dyebath. 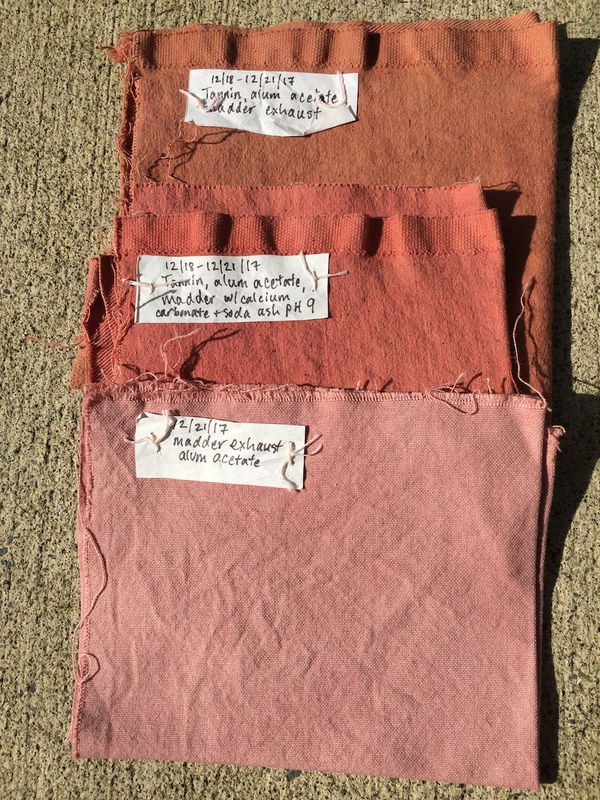 For the rest of the experiment, I prepared small pieces of cotton cloth with three different treatments, which I’ll describe below. 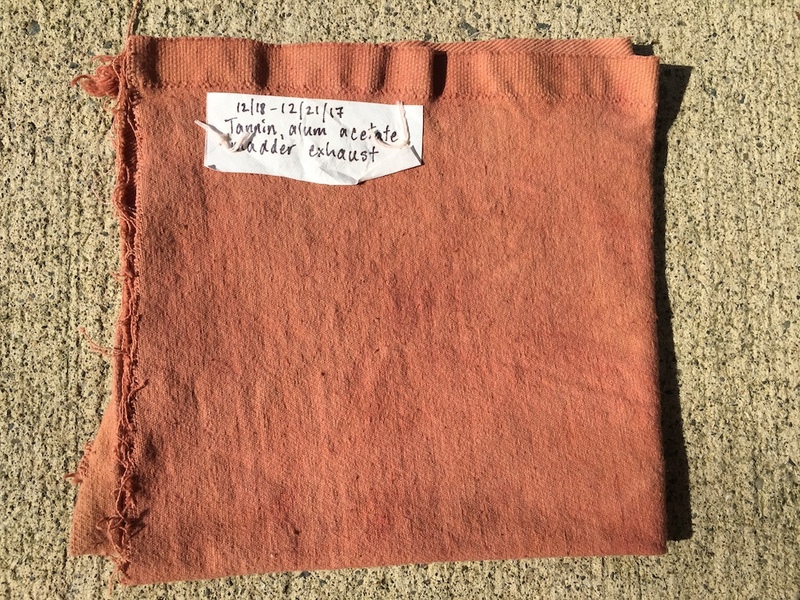 You can read my original post here for a description of how I made the madder dyebath and prepared the fiber. Usually when I’m extracting madder roots, I use calcium carbonate and soda ash to make the water mineral-rich and alkaline. 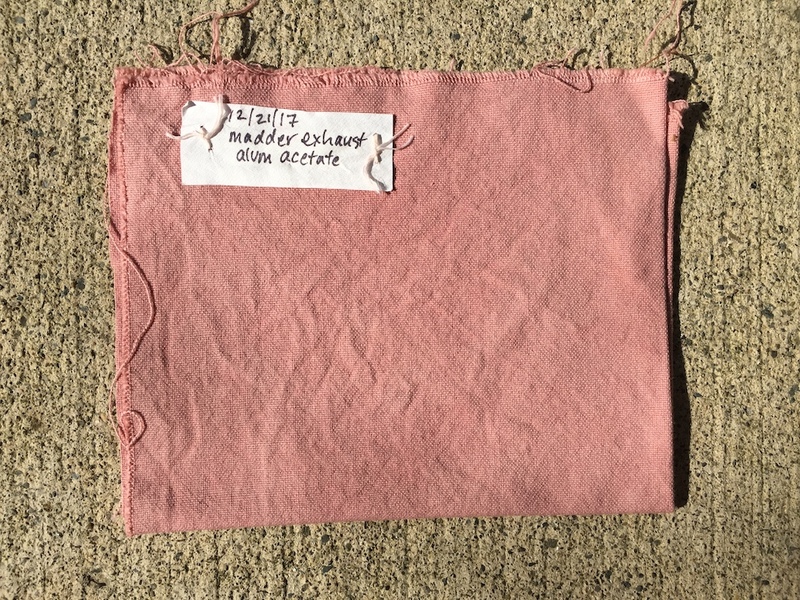 The soda ash is inspired by a comment by Rita Buchanan in A Weaver’s Garden that “the pigment alizarin dissolves better in alkaline solutions.” In Jim Liles’ recipe for “Amish Madder Purple” he directs you to use calcium or chalk in the dyebath (though he specifies calcium acetate). He doesn’t mention pH, so for that sample I didn’t mess with the pH (which was 7). However, in the other half of the madder bath, I added a half teaspoon of calcium carbonate *plus* a teaspoon of soda ash, which brought the pH up to 9. The bath got noticeably pinker. When I’m working with madder, I try to keep the temperature below 160 degrees F. I have read some recipes that call for strategically manipulating the temperature higher than that, and even boiling for a limited period of time, but I haven’t tried them. So, in this case I kept the temperature below 160, maintained it for an hour, and let the fiber cool in the bath overnight. 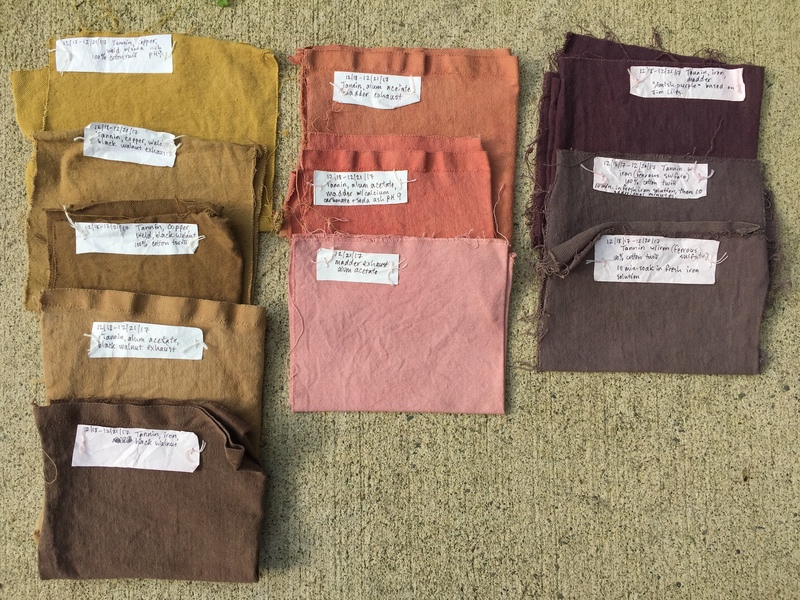 Then I combined the two dyebaths and added the next sample. The sample below was tannin, alum acetate, and madder exhaust. I didn’t add any soda ash to bump up the pH, nor did I test it. To my eye, it’s more orange-brown than the first sample. Lastly, I put in a piece of cloth that was not treated with tannin. This was a thick 100% cotton plain-weave piece. 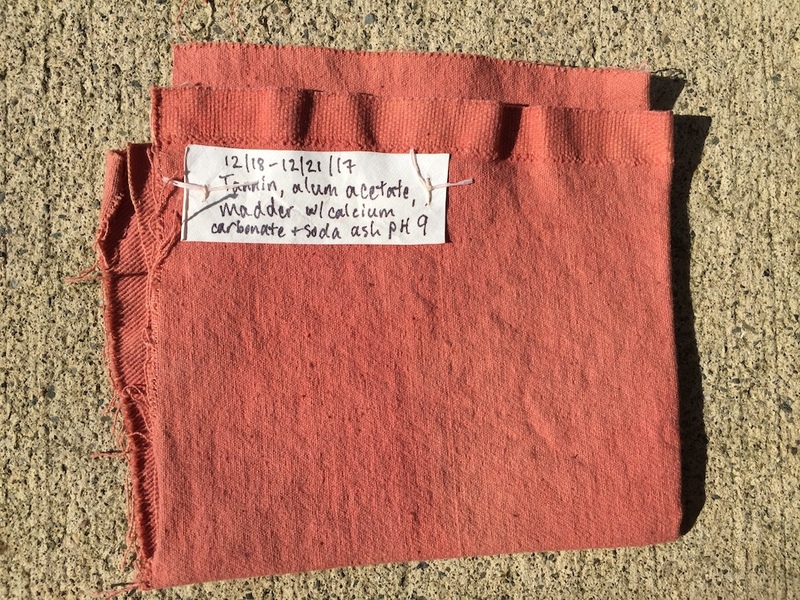 It was scoured, mordanted with alum acetate (along with the other aluminum acetate pieces I’ve described in this series of posts), and then dyed. 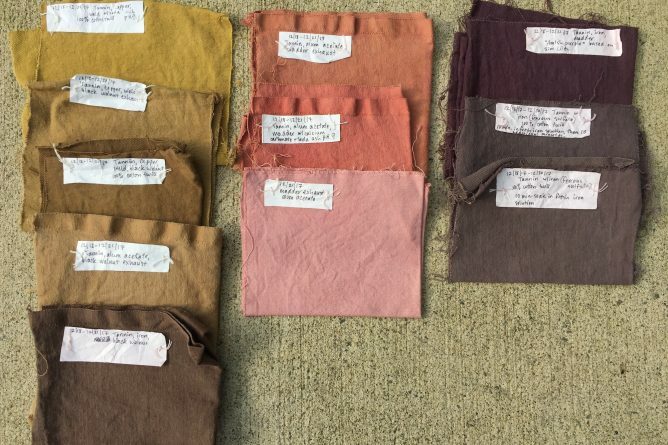 Excited about the possibilities of tannin to extend the range of colors I can get on cellulose fibers. Excited about trying alternate recipes for mordanting cellulose that I came across while researching these topics, including Maiwa’s process for a combined aluminum acetate-aluminum sulfate process as described here. Scroll down to the section titled “How to Mordant Cotton or other Cellulose Fibers”. For cellulose fibers, I still love linen more!